There’s a good reason why seniors live it up in Las Vegas! There are many great Las Vegas deals for senior citizens, both visitor and Las Vegas senior living here! It’s affordable, it’s fun, it’s nearly always a perfect Las Vegas weather forecast, there are tons of Las Vegas vacation rental homes and cheap Las Vegas hotel rooms, terrific shopping in Las Vegas, and fantastic restaurants and entertainment. Amazing Las Vegas Discounts! And if that’s not enough; it’s the convenience of printable Las Vegas coupons to shows, restaurants, and events around the city that keep seniors and others coming back year after year, and many making it permanent for Las Vegas senior living. What could be more nostalgic and reminiscent of good times past than a 2-for-1 admittance to some of Las Vegas’ hottest performers and celebrity impersonators to the memories of The Rat Pack and Elvis Presley, or a big band orchestra? Who loves game shows more than senior citizens? What if you could participate and WIN cash and prizes live? This is one of the many great Las Vegas deals for senior citizens. Part of Las Vegas senior living is the live show of Name That Tune; a classic game show you can get 2 for 1 admission or 50% off single admission. Get your printable Las Vegas coupons here. Enjoy Las Vegas headliners with nightly surprises from headliner comedians with this 2-for-1 offer at the Comedy Club; or laugh and be entertained with a variety of acts, juggling, comedy, and amazing performing animals at the Popovich Comedy Pet Theatre. Maybe you are not interested in the night life and Las Vegas headliners; and just want to enjoy the wonderful Las Vegas weather in the good ol' outdoor sunshine. Hitch your plans to Wild West Horseback Adventures with free pick up and return to your hotel and have breakfast, lunch, or dinner while you take life easy in the saddle. Why pay full price when you can get Las Vegas Shows & Dining for Half Price! Part of Las Vegas senior living and one of the great Las Vegas deals for senior citizens visiting is the Show Bus of the Stars. Grab a 2-for-1 pass for a one of a kind London double decker bus of traveling entertainment. Enjoy a wonderful champagne breakfast with unobstructed views of the Las Vegas valley on a Sunrise Balloon Flight with Vegas Balloon Rides with complimentary ground transportation. I’ve watched these for years and have always been in awe of them. Nothing is prettier than a bunch of very colorful hot air balloons against our clear blue sky and the backdrop of our mountains at Red Rock Canyon and Mount Charleston. Speaking of romance, why not finish the day at the most romantic French restaurant in Las Vegas? The Pamplemousse is one of Las Vegas’ oldest and finest restaurants. Or treat yourself to one of the finest cuts of grilled meats in Pampas Restaurant; or take in the jungle-like atmosphere in the Rainforest Café. Dance to the oldies of Motown, rock and roll, disco, and todays’ top hits at one of the many night clubs; or enjoy Salute Dueling Pianos Lounge next to Jersey Boys Theatre. On a more casual note, visit the Queen Victoria Pub, the only British pub on the Las Vegas strip, featuring authentic English, Scottish, Irish, and Welsh dishes. 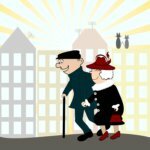 Las Vegas senior living locals know these are just a few of the Las Vegas deals for seniors, where you can get 50% discounts with printable Las Vegas coupons and certificates of admission. See shows, dining, and attractions for unbelievable discounts, some as low as $29.95! It’s these low prices that seniors enjoy in Las Vegas. The list is as varied as the activities offered. Other Las Vegas deals for seniors, you can see indoor skydiving Las Vegas, visit Las Vegas dance clubs, enjoy Las Vegas trade shows, love the outdoors of Horseback Riding or watching events of the annual Rodeo, take a Dinner Cruise on Lake Mead at sunset or rent a houseboat for the day. Heck, we even have drive-through Wedding Chapels! Las Vegas senior living residents know sometimes it's better to stay indoors and try their luck with a Las Vegas Senior Poker Tournament, or just find a comfortable spot and “people watch”. Whatever your choice of Las Vegas deals for seniors, that's one of the favorite pastimes here. This is real world Las Vegas, and this is why Seniors Live It Up in Las Vegas! And remember the cliche' . . . "What happens in Las Vegas, stays in Las Vegas" unless you tell your friends and family how hospitable we are! !